For Mother's Day Ryan asked me what I would like to do. I thought about what would make the day special for me. Digging deep I realized what I really wanted was a simple day with my family. We ended up driving down to Mission Viejo to meet Ryan's grandparents and Aunt Nancy for a picnic at the park there. 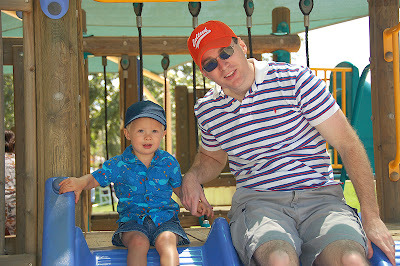 It was a beautiful afternoon and Dylan really enjoyed playing on the incredible playground there. Later, after a nice nap, we all took a long walk before dinner. And it got even better as I opened up the freezer to find a lovely (and you'd understand the depth of this gift if you knew how much I adore ice cream) Baskin Robbins ice cream cake. Yeah, that was a nice touch. Good job, Ryan. We've been devouring that little cake since Sunday. It's nearly gone but I'm going to savor that last piece tomorrow after my workout. Sounds like you had a great Mothers Day -- tell your husband GOOD JOB for making your day special!